Goldfish ponds are a beautiful addition to any garden and a stunning focal point. 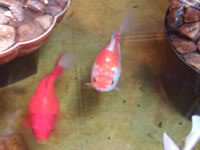 Goldfish ponds have been admired in Asia for centuries, especially in China and Japan. Today, you will find goldfish ponds all over the world, including Europe and North America. Since the Goldfish hails from a wild carp that can live in cold water, the Goldfish will survive outdoors during the winter even in colder parts of the world. In some regions it is however advisable to house your fish indoors during the roughest months since it can suffocate in a pond if the ice freezes across the entire surface. Goldfish can be kept in ponds as well as in above ground pools. It is recommended to plant your pond/pool since goldfish will feel much safer in a natural environment. It will also be able to hide among the plants in order to avoid predators. A lot of animals like to chase and eat goldfish, including cats, birds and raccoons. Sometimes plants are not enough to guard your fish and you will be forced to cover the pond with netting during the night. In an above ground pool with straight sides, the predators will be unable to wade in and must instead perch themselves at the edge of the pool when looking for prey. This will usually be noticed by your goldfish and it can seek shelter deep down in the pool. A planted goldfish pond is easier to maintain since the plants will aid you in keeping up the water quality. Live plants can use organic compounds excreted by fish as nutrition. This means that the organic waste will be absorbed by the plant instead of staying in the water and polluting it. Live plants will also inhibit algae growth since plants and algae compete for the same nutrients. If you still experience excess algae growth, you might be feeding your fish too much. If you feed your fish a lot of food, they will subsequently produce a lot of waste and there will be plenty of nutrients for plants as well as algae in the water. Some algae are a natural part of any pond or aquarium, but excessive algae growth should be counteracted since it is unhealthy for the fish. Keep in mind that if you use a chemical to kill the algae, or if an algaecide is involuntary introduced to the pond, the dead and decaying algae will use up a lot of oxygen and your goldfish might suffocate and die. Using natural methods to combat algae, such as plants, is therefore recommended. When you have filled your goldfish pond you should treat the water with a water conditioner if you use tap water containing chlorine and/or ammonia to fill your pond. Check that the water temperature in the pond is at least 60° F before you add any fish. A common beginner mistake is to add all the goldfish simultaneously to their new home. This will cause a rapid change in water quality since the bacterial colonies that inhabit the pond are too small to process the sudden increase in organic waste. Instead, you should ideally add one or two fish and allow the bacterial colonies to grow larger before you add any new fish. 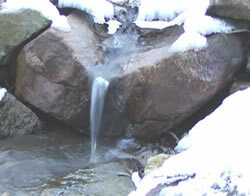 This will naturally also depend on the size of your pond and if you are using any type of filtration. In a large pond, excess waste will be dilute by a very large amount of water and therefore less likely to reach concentrations high enough to harm you fish. Good filtration will also help removing organic waste and other toxins from the water. So, how many Goldfish can I fill my pond with? As a rule of thumb, one Goldfish per 30 gallons is recommended, but this is naturally a very imprecise ratio. As mentioned earlier, the water quality is one of the limiting factors. Plenty of water, developed bacterial colonies and good filtration will make it possible for you to house a larger number of Goldfish. There are three basic types of filtration: biological, mechanical and chemical. Biological filtration will be taken care of by the mentioned bacterial colonies. A mechanical filter will filter the water through some form of filtering media where larger debris will get caught. The most common form of chemical filtration is the addition of carbon to the mechanical filter, where the carbon will bind various types of toxins. Another important factor to keep in mind when you decide how much fish you wish to add to your pond is aeration. Fish require air to breath and will suffocate in a poorly aerated pond, especially if decaying plant matter consumes a lot of the dissolved oxygen. In an open pond, there will however be a considerable gas exchange between the water and the surrounding air. The larger the surface area of your pond, the more oxygen will be brought to the water. A large surface area will also make it easier for the water to release carbon dioxide. Plants in the pond will also produce oxygen and consume carbon dioxide. In some ponds, this will however not be enough and if you want to be able to house a large number of Goldfish some type of aeration is recommended.